The move could be excellent step for the AP. If they can figure out how and what to charge for licensing their content online. The company is already struggling to find the right price for its content in print. AP content is licensed to a large number of newspapers internationally, that pay a fee to put all or part of AP articles in their pages. But declining revenues across the board in print media have put that agreement under strain. Already this year the AP has rolled back fees to U.S. newspapers. The struggle has been exhacerbated online, where many blogs and websites cite AP articles for no charge. Last year, AP sued The Drudge Retort blog for using its content without proper attribution. But the case was dropped and AP is still struggling to find the right model for content online. Now, when anyone takes AP content to put on their site, the co-op will be able to track it. And eventually, charge for it. But tracking and charging for content could be a double edged sword for publishers. While the AP can wring some money out of blogs and other sites with a service like this, they could also silo themselves by charging a prohibitive fee. Bloggers looking for articles to cite may simply skip over content that charges in favor of free news. Especially in the case of AP articles that house content that often found elsewhere, that’s a problem. The trick is to make the rates fair, a task more easily said than done. Another, perhaps more blog friendly option, would be using tracking technology to create new advertising models. Technology that tracks online content cannot be far away from a service that allows advertising to be served within pasted copy. Other sites like Politico are already imbedding links in their text (try to copy and paste content from a Politico story into a Word document to see how that works). 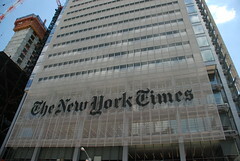 The New York Times has hinted that it might start including ads within its content. And this week AdBrite became the first ad network to sign on to the Fair Syndication Consortium, an online publishing group that plans to broker deals with ad networks to track content online and split ad revenues between parent sites and publishers whose content gets cited by aggregation or syndication. It’s all still unclear how this will shake out for publishers, but keeping better track of content online is a first step towards makng some more money from it. By all appearances, the question isn’t whether the New York Times will revisit paid subscriptions. The question is what those subscriptions will look like. Last week, Gawker published documents purporting to detail two possible online subscription packages the newspaper company is mulling over, New York Times Silver and Gold.